Spike Chunsoft has launched the steam page for their upcoming mystery-visual novel Zero Escape: Zero Time Deilemma. The experiment wasn’t supposed to be like this. Think Your Way OutExplore 3-D environments for clues to solve mind-bending puzzles and escape your prison. Decision GameQuestion your morality in a series of life-or-death decisions where even the best option carries horrifying implications. Cinematic GameplayFully voiced and animated story sections push the boundaries of interactive fiction. Non-linear NarrativeJump freely between events and characters to piece together the fractured narrative and unlock multiple endings. 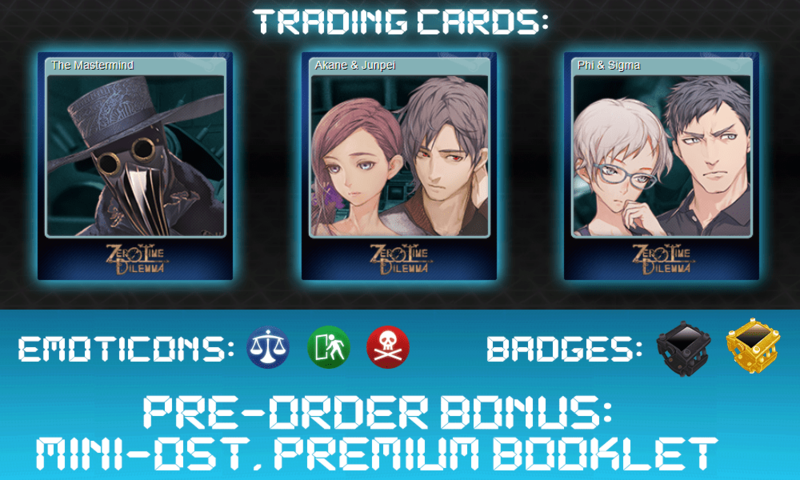 Old Faces, New MysteriesCharacters from the award-winning Nine Hours, Nine Persons, Nine Doors and Virtue’s Last Reward are joined by a new cast of participants to bring first-time players up to speed and conclude the series for longtime fans. What happened during the cohabitation experiment at Dcom before the events of the game? Series director Kotaro Uchikoshi takes you into the minds of the cast with this collection of vignettes. This 48-page booklet also includes illustrations and design documents with comments from character designer Rui Tomono, a summary of the Zero Escape series and original puzzles. Contains MP3 and FLAC files. All songs written by Zero Escape series composer Shinji Hosoe. Zero Escape: Zero Time Dilemma is coming to PC on June 29.